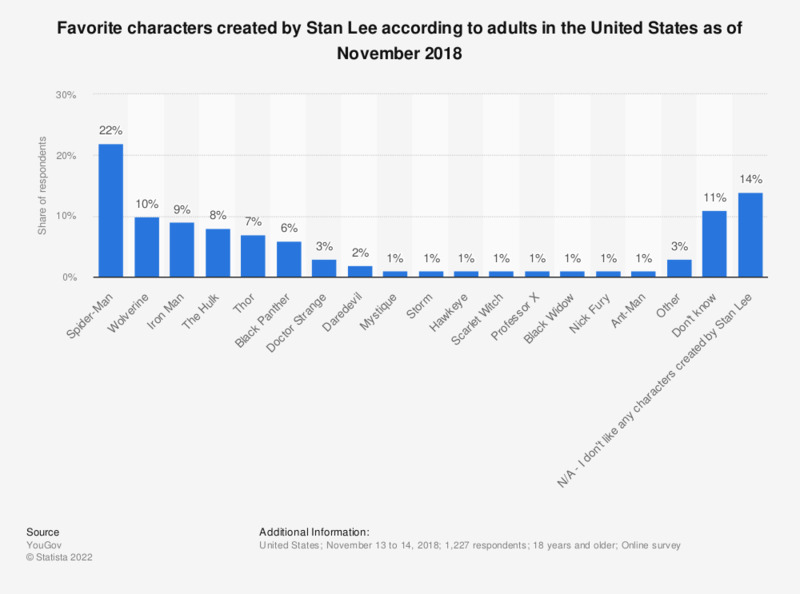 This statistic shows the favorite characters created by Stan Lee among adults in the United States as of November 2018. The data shows that ten percent of respondents said that the X-Men character Wolverine was their favorite Stan Lee creation. At the top of the ranking was Spider-Man, with 22 percent of respondents citing the superhero as their favorite. Stan Lee was a popular American comic book writer as well as an editor and publisher, and co-created Marvel in 1961. Over the course of his career, Lee won several awards for his work and has a star dedicated to him on the Hollywood Walk of Fame. The writer also made frequent cameo appearances in films within the Marvel Cinematic Universe franchise. After his passing in November 2018 aged 95 years old, Roy Thomas was named as Lee's succeeding editor-in-chief at Marvel. Everything On "Superhero movies" in One Document: Edited and Divided into Handy Chapters. Including Detailed References.